NeverSeconds: The journey through JAM continues…. The journey through JAM continues…. Today’s lunches are from Alexandra, Nikka, Julien and Ryogo. Alexandra was really eager to participate, and she brought one of her favorite foods: a croissant! 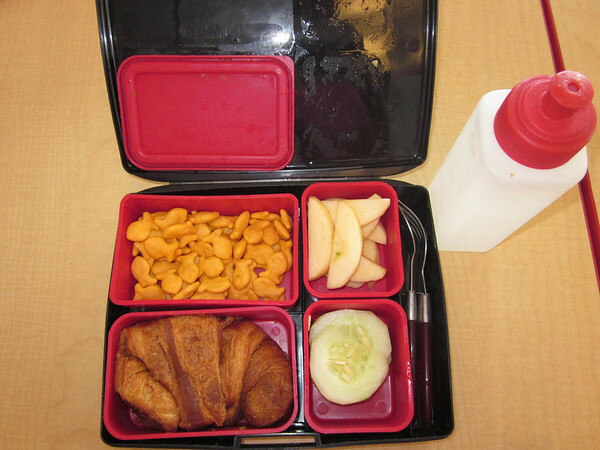 You can see that she has an elaborate lunch box, with separate dishes – the croissant is in the one at lower left. She also has fruit (sliced apple), salad (cucumber) and a treat (mini crackers). She told us that another favorite food of hers is Mac & Cheese! Nikka’s mother explained to us that his lunch is “Pelmeni” which is a traditional Russian dish. Pelmeni are dumplings, which consist of a filling wrapped in dough. Nikka’s pelmeni has meat inside. 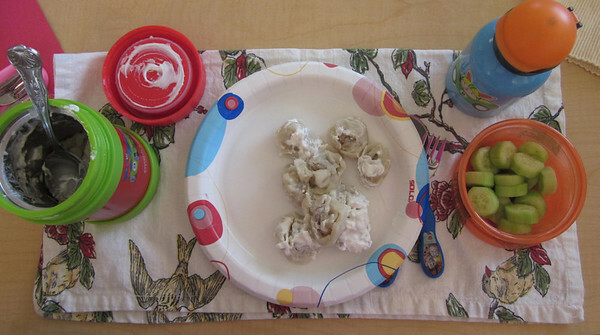 Pelmeni originated in Siberia. He also has cucumbers in the pot on the right and a drink. Julien was really interested in learning about what people have for lunch at other schools. He was impressed that some children didn’t have any lunch and that a child about the same age as his older brother is helping to change that. 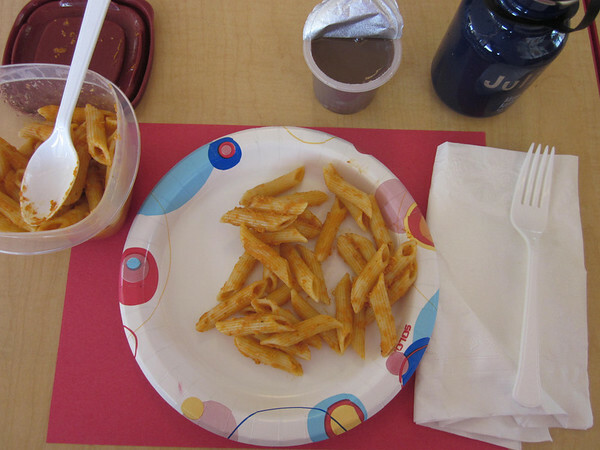 Julien is part Italian and his lunch today is a typical Italian dish, penne with tomato sauce, which is usually served as a first course at lunchtime. He made sure to let us know that he also loves gnocchi, another Italian dish. He is having chocolate pudding for dessert. Food dropped or spilled on the floor: working at it! Tomorrow we will see the lunches from three other classmates! JAM - I love seeing the different lunches from the different cultures. How fun to get to see everyone's lunches! 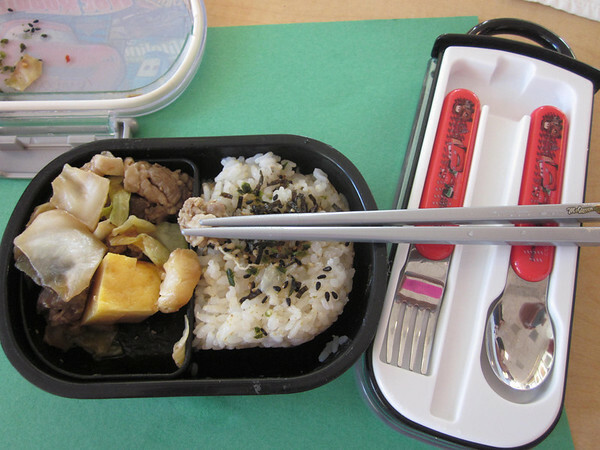 Do you ever do lunch swaps where everyone can try the different types of lunches? Unfortunately we don't swap lunches because of concerns about possible allergies, however there are opportunities here at school, such as the International Food Fair, where they get the chance to try different cuisines. What was in Ryogo's lunch? I can see rice with black sesame seeds, either a potato or turnip/rutabaga?, meat (beef? ), cabbage? Also, is your school for children of diplomats or workers from overseas? "25 million fully grown trees every year" are used in the production of disposable chopsticks...according to wikipedia. That seems very wasteful. Where is the first child, Alexandra from? All lunches look very tasty. One great meal, two that look alright and one I wouldn't give to my child (if I had one..) even if it would get a real meal later that same day. Thank you so much for the team work involved in this weeks blogs. 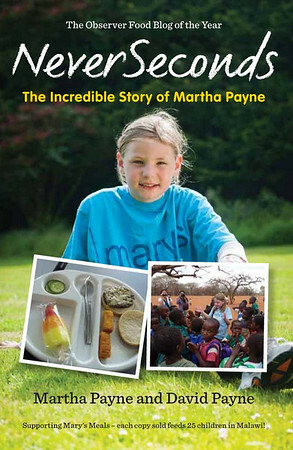 It is amazing to see all the different lunches each child brings to school. What a wonderful environment for children to learn in. I wish that my school could have those lunches. But i do think your blog is very good keep it up.